Msgr. 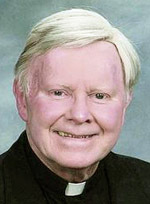 Joseph T. Kane, 82, pastor emeritus of St. Robert Bellarmine Parish, Warrington, died May 18. Born in Philadelphia, the son of the late Francis L. Kane and the late Catherine V. (Bolton) Kane, he attended St. Matthew School, St. Joseph’s Preparatory School and Northeast Catholic High School before entering St. Charles Borromeo Seminary. Msgr. Kane was ordained May 19, 1962 at the Cathedral of SS. Peter and Paul by then Archbishop John J. Krol and his first assignment was as parochial vicar at St. Michael, Chester. He also served as parochial vicar at St. Augustine, Bridgeport; St. Joseph, Collingdale; St. Martha, Philadelphia; Immaculate Conception, Jenkintown and Our Lady of Fatima, Secane. He was then appointed pastor of St. Robert in 1986 served for 19 years until he was named pastor emeritus in 2005. He also served as administrator at Regina Coeli, a residence for retired priests of the archdiocese. He remembers not long ago the two were talking about a fellow priest who had a hard assignment, and Msgr. Kane remarked he never had a difficult assignment. Msgr. Kane loved sports, especially the Phillies. “You could call any time but don’t call when the Phillies were playing,” Deacon Morris recalled. There will be a viewing Wednesday, May 25 at 9 a.m. for Msgr. Kane at St. Robert Bellarmine Church, followed by his 11 a.m. funeral Mass celebrated by Archbishop Charles J. Chaput. Concelebrants will include Bishop Timothy C. Senior, Bishop Joseph Martino, Msgrs. James Beisel, Richard Bolger and Joseph Garvin; Father Raymond Himsworth and Msgr. Cribben, who will be the homilist. Msgr. Kane is survived by his brothers Thomas F., Francis X. and James Kane, and nieces and nephews. Interment will be at Resurrection Cemetery, Warminster.